This magical place poses many charms for culture, relaxing activities such as biking, strolling on sanding beaches or doing yoga. Moreover, there are many famous landmarks in Bali that worth visiting. You haven’t been to Bali if there are no photos in these places, such as Kuta, Seminyak, Beaches, Kecak dances. Here are some advantages of going to Bali. You will always see a friendly smiling face where ever you go in Bali. It is literally the home of some of the friendliest and most welcoming people in the world. The friendly locals have a strong sense of helping others, and with their fluent English, you will have no problem getting around the city. Even passerby can give some direction to help with no problem. You can experience Balinese traditional way of life during a visit to Bali. There are many Bali tourist attractions to visit. 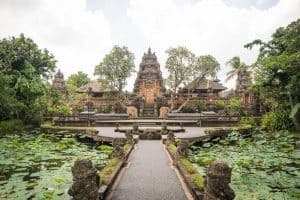 The small island has more than 20,000 Bali temples that spirituality integrated to Balinese people. Join in among their many unusual festivals in Indonesia and ceremonies that feature traditional Balinese dance, music, drama and stunning music. You will witness many cultural things can only find in Bali. Bali cultural cuisine also worth to try. Take any local cooking classes and immerse yourself to their culture. 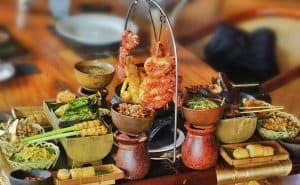 There are so many traditional foods that are a must eat in Bali Indonesia. You can even dress like the local by wearing flowers in your head and several authentic clothes. There are some iconic places for selfies and photo spots scattered in Bali. Among the most famous destination in Bali is the dinosaur island, the swinging in Bali swings and a picture between the Bali gates. However, the star of going on a trip to Bali is the island natural attractions. 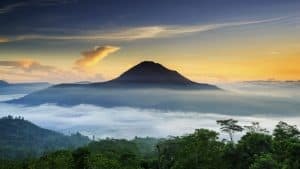 You can enjoy picturesque rice terraces, soaring volcanoes, sacred caves, pristine crater lakes, lush tropical forests and a dramatic coastline to enjoy. All depict jaw-dropping scenery. Visitors can enjoy the green scenery in the famous park in Bali, or go to the beaches and enjoy the beautiful sunset. You will find difficulty in trying to find the time to visit them all. Bali has among the most healthy food choices. It offers raw and vegan-friendly food for many who like to keep in shapes. In the digital world, more and more people come and work digitally. Most of them consider working in front of a laptop in any cafe or restaurant as a goal job in the world. So there is no surprise to see foreigners flocking Bali cafes. Bali offers all nighter non-stop shopping spree. It has various items that you must buy when in Bali. The Balinese street market offers many rattans and traditional handmade accessories from hat to bags. 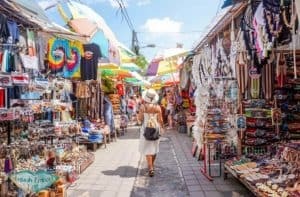 The markets at Kuta, Ubud, and Sukawati are always a great spot for shopping at affordable prices. You can even get the best deal if you can bargain. Bali has a wide range of outlet from Indonesian and International brands, moreover, it is a heaven for sports outlets. Edgy boutiques in Seminyak offers various items from traditional items, international brand, and accessories. You can stretch dollars on this island, just make sure you do the proper research first. Places in the downtown area will be more expensive. Fancy restaurant, international outlet, the western hotel will definitely very expensive. However, anything traditional may just be extremely cheap. There are houses for rent with Balinese dishes with are very affordable. If you are an adventurist person, Balli is calling you. There are many water sports activities for any daredevil out there. You can try parasailing, surfing, boatings, along with the side the numerous beaches. Other places offer water boom, water theme park, white water rafting that surely make you excited. if you feel adventurous chase some of the famous waterfall in Bali. This is a small island, you can get anywhere easily with a rented bike or the online rented motorbike. The island had an International airport for both local and foreign visitors. You can find a rented car in various social media. Even if you are going to Bali for the weekend, there are already packages that offer a rich glimpse of Bali. For one venue to another, the distance is quite close. Overall Indonesia has a warm climate. Bali offers a nice tropical climate and even is quite hot during summer. It is a great place to enjoy yourself under the sun. 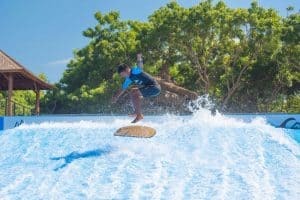 Everyone can hit the beach just for strolling down the sanding beaches, swimming, sunbathing or even try out the wave by surfing. 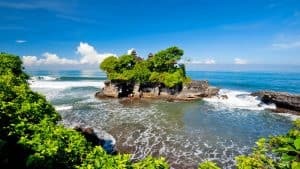 It offers many great beaches for Bali surf spots and various sports activities under the burning sun but quite breezes with a lot of windy atmospheres. Indonesian called Bali as the Island of thousand Gods. It is the home of numerous temples and cultural-spiritual events. In a certain part of the temples, it is obligatory to wear a Sarong, even if you are a foreign visitors. The countless temple complexes, spread throughout the island from the highland peaks, down to the limestone cliffs to the low-lying seashores. These ancient legacy are not merely archaeological sites but also are still functional with colorful celebrations and regular festive anniversaries. Couple dream of going to Bali for their wedding, honeymoon or anniversaries. There are many wedding venues in Bali perfect for a wedding ceremony, in the high hills or the sandy beaches. The bride and groom can even try to perform the traditional Balinese wedding traditions. The green romantic also sprung around their hotels, cafes, and restaurants. There are many activities that perfect for a couple to try in this heaven for lovers. Bali street is always full of life. It serves some of Indonesia’s best restaurants, cafes, and clubs. You can hang out by the beaches with live music and great companies. many people come and have some fun under the Bali stars. There are many street musicians, musical cafes and vibrant endless clubs sprung across the city center. It is a choice for someone to spend a night in the city.